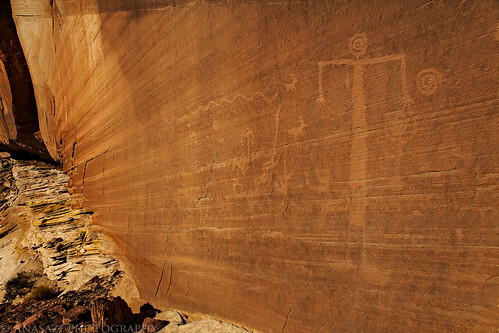 While I was out exploring the Paria Plateau in Arizona last weekend, I spotted this nice petroglyph panel high up on one of the sandstone buttes. The main anthropomorph with the spiral head is probably between three and four feet in height for a little scale. I like the way the lines in the sandstone lead down towards a small alcove located below.